Troy Balderson made several stops in the county introducing himself to local residents at 8 Sisters Bakery. MOUNT GILEAD — Troy Balderson returned to Morrow County after being sworn into Congress for a meet and greet on Oct. 3. Balderson a Republican from Zanesville, defeated Democratic Franklin County Recorder Danny O’Connor in a special August election for the U.S. House of Representatives seat which was vacated by Pat Tiberi. He currently represents Ohio’s 12th Congressional District in Congress. Prior to serving in Congress, he was a State Senator for Ohio’s 20th district where he served as Chairman of the Senate Committee on Energy & Natural Resources and served as a member of the Senate Finance Committee. Prior to his time in legislature Troy and his family owned and operated a Farm in Adamsville, Ohio. He attended Zanesville High School and both Muskingum College and The Ohio State University. He and O’Connor will run against each other again in November for districts which include Delaware, Morrow, Marion, Muskingum, Richland and portions of Licking Counties. Balderson said he plans to visit his district and get his messages on immigration, opioids, spending, farm bills, trade and tariffs out to the people. 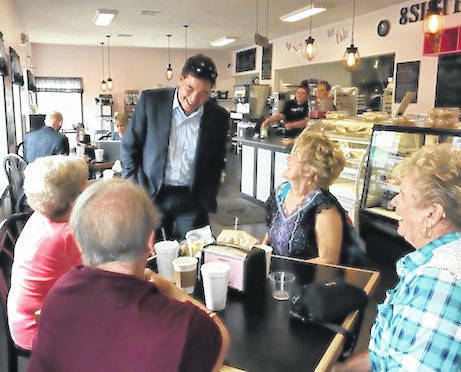 Balderson made several stops in the county introducing himself to local residents at 8 Sisters Bakery and The Rusty Horseshoe. He also meet with elected officials to review their concerns in the community.